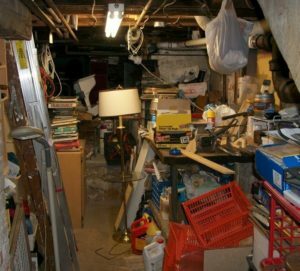 Basement cleanout isn’t exactly an exciting prospect but converting it into a more comfortable, functional space or adding extra livable square footage is a lot more inspirational. After all, there’s a lot of room to recapture and use, so it’s not only a more functional and enjoyable space, it also adds to the property value. Homeowners do basement cleanouts for many reasons. Primarily, it’s to reclaim precious space, whether it’s for more storage, a laundry or mudroom, a combination, or living space. But once it’s done, you can make better use of the room. If you’ve done a garage workshop conversion or just gave thought to transforming that dank basement into something awesome, you should first know what to expect. This doesn’t mean the work ahead, but rather, the return-on -investment. In the vast majority of cases, a basement conversion will bring a solid return in more than one way. Of course, there’s the monetary return but also, the enjoyment of the new space. Clear a clutter-free walking path. If you do not have a walkout basement, you’ll need to do yourself a huge favor and clear a walking path from the steps to the front or back door. Basically, you need to have a clutter-free walking path so you can work without tripping or negotiating obstacles. Organize everything into three piles. As you bring items out of the basement, place them into one of three piles: stuff to keep, items to donate, give away or sell, and junk to throw out. You’ll probably be surprised about how much stuff you’ve accumulated and if you do an earnest purge, you’ll free up a remarkable amount of space. Junk anything that’s no longer necessary. Once you have your three piles completed after the basement is empty, be ruthless and get rid of as much as possible. Anything you haven’t used in several weeks, many months, or even years is a prime junk candidate. Neatly organize what’s staying in the space. Now that you’ve done an all-out purge, you’ll have less stuff to store. But that doesn’t mean just piling it in a corner. Take the time to neatly organize what you’re keeping and you’ll have more room to enjoy. If you don’t’ have the time and need a basement cleanout done, go ahead and phone 800-433-1094 or visit Junk Garbage Removal. Our crew will do the work for you and haul any junk away, as well.